Download the UPS job application using the .PDF link on this page, or follow the instructions posted below to learn how to fill it out online. You can apply for several different types of positions including dock worker/loader, driver, store representative, customer service representative, and more. One of the benefits of applying online is that you can view multiple openings (as well as apply to multiple locations). Note: Corporate positions can only be applied for online. Step 1 – Go to the UPS jobs website. Step 2 – Click the “Search Jobs” button. Step 3 – Enter your location, select a radius, and then submit a keyword (if applicable). Press the “Search Jobs” button to load the results page. Step 4 – Scroll down the page to view the available openings. Click the job title of the position you’re interested in applying for. Step 5 – Review the position description/requirements. When you are ready to apply click the “Apply Now” button as outlined below. Step 6 – If you already have an account sign in using the login form. If you don’t have an account you will need to create one (click the “Sign Up” button). Step 8 – Press the “Create Profile” button to finalize the registration. Note: Each position has different qualifications. Select the shift(s) you are available to work. Step 11 – Press the “Continue” button to move on to the next section. Step 12 – Complete all of the required sections of the form. Review your application for any errors, and then submit it. Step 1 – Download the .PDF file. Note: This file is for UPS Store positions. 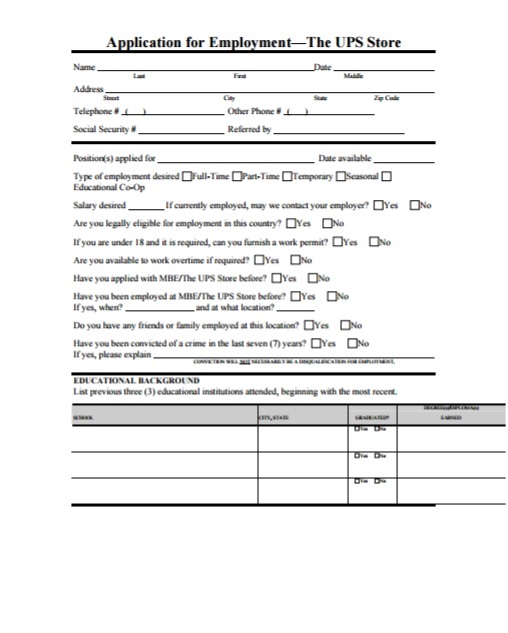 Step 2 – Print the form out (or use a.PDF editing program to fill it in). If you’re eligible to work in the U.S. Submit your education history details. Step 6 – Complete any remaining sections of the application.